Great job! This is really useful! Good timing... I just installed the existing version (1.3.x) and I'm confused about how to add this to my rover. I looked at the Imgur description images, but I don't see what part(s) I need to add to my vehicle. I installed the updated mod and took the Purple People Eater for a drive, but I'm not sure if it's working as anticipated. 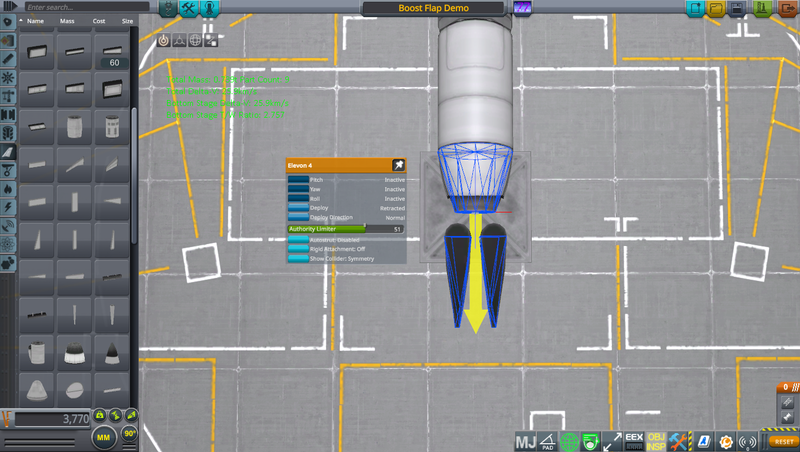 If I enable Boost Flap in the Elevon right click menu, the parts just stay flat (orientation is parallel with the ground) so not blocking the jet exhaust at any time. I tried jumping over the runway a few times to get the flaps to close, but no luck. Unfortunately I'm still not getting any adjustments of the elevons. Here's how I've got the three components (BFC control unit and the two elevons at the rear of the Purple People Eater). When I get airbourne (using the runway as a ramp) the elevons aren't moving to "brake" position. 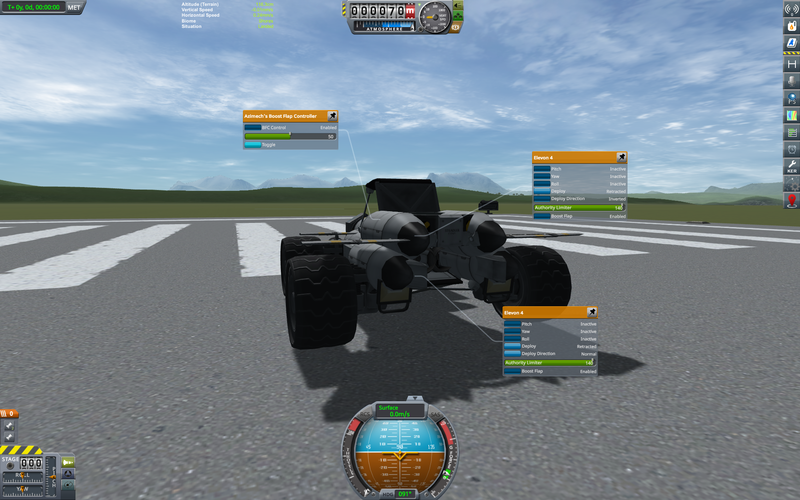 The Brake Flaps on their own seem to be working though, as the RCS toggle control does make them close, just not automatically when the vehicle becomes airbourne. I just tried that, but it doesn't seem to make any difference. Strangely though, the toggle button doesn't graphically change when clicked on, staying in the bright blue, solid button state. @DoctorDavinci Thanks for updating this. Not tried it out yet, but I will soon! 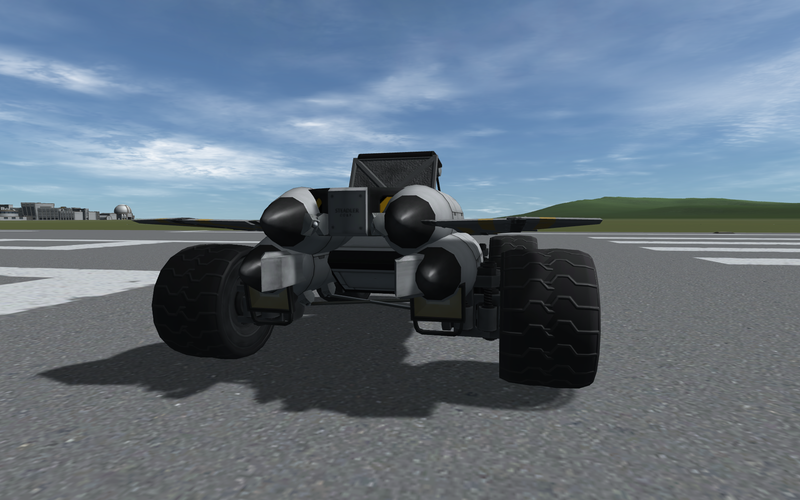 Still tinkering with general rover design for the race, but don't worry about my request to add support for the service bays. I've changed my design to use flaps now. If adding it is easy (and not one of those programmer "it'll be easy"... *10 hours later, kinda things) then I'd be interested to compare my two designs (flap vs service bay) and see which is better, but don't worry if it's gonna be a hassle! I think i'm having the same issue as @purpleivan; I've got the BFC controller attached, set to enabled and my two boost flaps have the boost flap option checked. 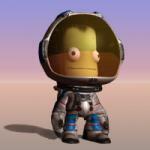 I've tried messing with the toggle option (via menu and hitting R). Initially I also had my flaps bound to the brake action group, in that case if I applied the brakes and the flaps closed the hitting R would override the brake action and open the flaps again. But that was the only thing I could make happen. I thought maybe having another action group controlling the flaps was conflicting (or inverting a state) so I removed the brake action group control from the flaps, but still not getting any automatic flap control. Thanks @DoctorDavinci I'll give it a try. The fix seems to be working! Nice one. My only issue is that if I use another action group (ie brakes) to also shut the boot flaps, then BFC stops working. I've not tried this yet, but if I change the `defaultActionGroup` in the `ModuleBFCAG` module in BoostFlapController.cfg to 'BRAKES' would that enable me to have automatic boost flaps but also have manual control over them when pressing brake? omg I'm such a dunderhead!! I hadn't realised you could assign an action group to the controller part, in game...like normal. So my attempts to change the action group in the cfg file was pointless. 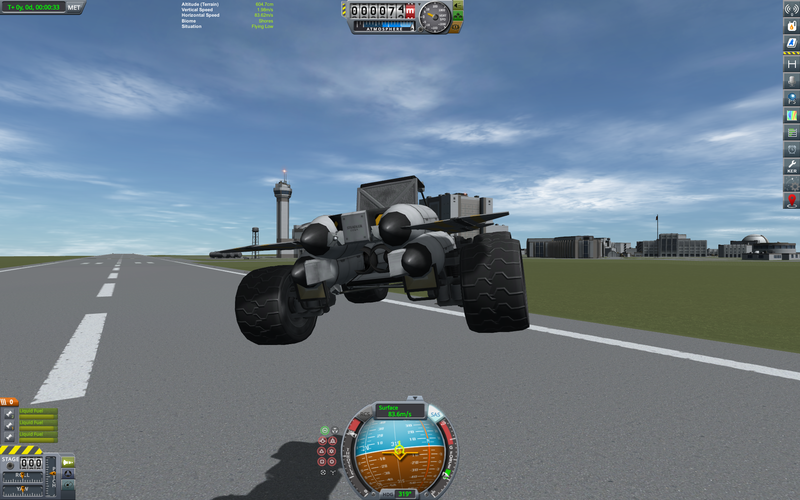 Anyway, it's working perfectly now; automatic deploy of flaps whenever off the ground, and manual override with the brake key. Controlling the flaps manually I was probably shutting the flaps correctly around 80-90% of the time, but I knew there were some points where I wasn't quick enough and they'd stay open longer than they should. So its nice to be 100% sure I'm not gaining speed whilst airborne. Also means I'm not having to brake so much; just did another test drive of the rally and shaved 15 seconds of my best time so far. Unfortunately, this mod is no longer supported and the OP has asked for the thread to be closed.